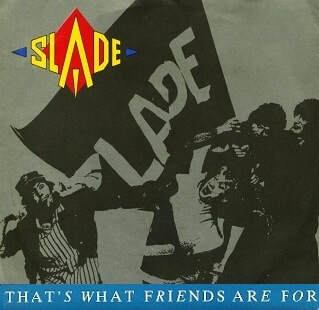 That's What Friends Are For is Slade's second single from their fourteenth studio album You Boyz Make Big Noize. Released by RCA on 20 April 1987, it reached No. 95 in the UK charts and remained in the chart for the one week. The song was written by Noddy Holder and Jim Lea, and produced by Roy Thomas Baker. Following the moderate success of the band's 1985 albums Rogues Gallery and Crackers: The Christmas Party Album, Slade began writing and recording material for their next album in 1986. Hoping to record a hit album that would put them back in the public eye, the lead single "Still the Same" was released in February 1987 but stalled just inside the UK Top 75. In choosing the next single, RCA selected "That's What Friends Are For" as the album's second single. Released in April 1987, a week prior to the release of You Boyz Make Big Noize, the song reached No. 95 in the UK. The commercial failure of both the single and album meant "That's What Friends Are For" was the band's last UK release under RCA. "That's What Friends Are For" was one of two tracks from the album to be produced by Roy Thomas Baker. Initially the band hired Baker to produce the entire album, but felt his working methods proved too lengthy and expensive. In the end, Baker completed only two tracks, using most of the album's budget on them alone. Prior to the single's release, in a 1987 fan club interview, Dave Hill said: ""That's What Friends Are For" looks to be the next single, mainly because there's a certain person up at RCA who is going wally over it." Describing the song, Hill said: "This is a 'scarf waver' type of number". "That's What Friends Are For" was released on 7" and 12" vinyl by RCA Records in the UK only. In Europe, it was given a 12" vinyl release, and a 7" vinyl release in Australia and New Zealand. The B-Side, "Wild Wild Party", was originally written and recorded in 1986 for the soundtrack of the British film Knights & Emeralds, along with another Slade track "We Won't Give In". It would later appear on the band's 2007 compilation B-Sides. On the 12" single, three B-Sides were included: "Hi Ho Silver Lining," "Wild Wild Party" and "Lock Up Your Daughters (Live)". The band's cover of "Hi Ho Silver Lining" was taken from the band's 1985 album Crackers: The Christmas Party Album, while "Lock Up Your Daughters" was taken from the band's 1982 live album Slade on Stage. No music video was filmed to promote the single. A video was reported as being possible had the single received sufficient airplay and reached the UK Top 50. In the UK, the band performed the song on the BBC children's show The Krankies Elektronik Komik. Upon release, "That's What Friends Are For" was a single reviewed on BBC Radio One's Singles Out programme on 18 April. The single received a thumbs up by Welsh singer/presenter Aled Jones, Dominica calypso musician The Wizzard and English radio broadcaster Janice Long. In a review of You Boyz Make Big Noize, Kerrang! said: "The 12 songs here all bear the unmistakable Slade stamp, 12 potential singles, 12 stomp-along, shout-it-out choruses. As ever Noddy sings his heart out, but after all this time even he sounds a little jaded, and "That's What Friends Are For" leans heavily on the sentimental." In the album's 2007 Salvo remaster liner notes, writer Chris Ingham commented that the song was "a strong record packed with memorable hooks".